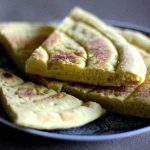 Moroccan savory crackers or “galettes salées”! 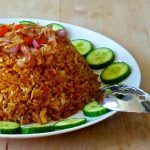 There are recipes that have to be told… I can’t always just talk about cooking and recipes without talking about my strongest culinary memories, those of these emblematic recipes of Jewish Moroccan cuisine. 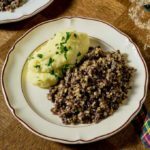 There are recipes that have not only been recorded by our taste buds for eternity but that also take us back in time as they relate to our roots and certain childhood moments. These famous savory crackers with anise and sesame seeds are one of them, as is dafina for that matter. 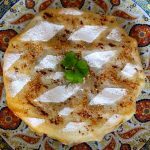 As I am publishing this recipe, I am bringing back memories of our grandmothers, our mothers, and our aunts throughout Morocco. 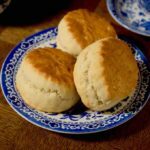 They shared with us a recipe, which like so many others, was handed down from generation to generation, and which reminds us who we are and where we are coming from. I will probably draw the wrath of other Sephardic Jewish communities including Algerians and Tunisians by claiming that those Moroccan savory crackers are unique in that they are the only ones of their kind. 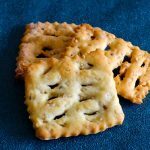 I am talking about about the real crusty and flaky cracker and not the savory shortbreads that are no less delicious but which absolutely does not follow the same process of preparation and decoration as the Moroccan savory crackers. 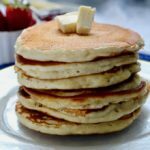 And there is one ingredient that will make all the difference: yeast! Yeast, of course, but also a lamination process that is centuries old. Those savory crackers are prepared just like a bread dough. 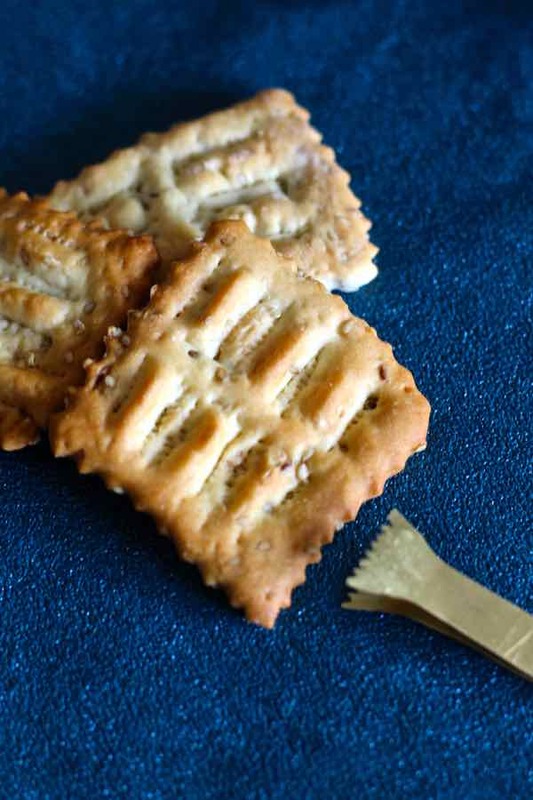 Yes, these crunchy little crackers are prepared with baker’s yeast! And to answer this question that people often ask me: yes, you can get a great crisp and laminated result even with baker’s yeast. For example, only to name a few, the famous Italian breadsticks (grissini) that also ask for baker’s yeast or these little Tunisian kakis, emblematic of Jewish Tunisian cuisine. The utensil that is absolutely necessary for this recipe is the pasta roller, the same that you’d use to make the famous Italian lasagna. With a simple rolling pin, even if heavy and smooth, you could never get the same result as with a real pasta roller. 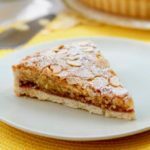 The “feuilletage” (puff pastry technique), which I explain in my recipe, is also mandatory. Next comes the most emblematic operation of those Moroccan savory crackers: the decoration. And this is where I will again talk to you about Moroccan cuisine and its unique techniques and know-hows. Considered one of the most prestigious cuisines in the world, Moroccan cuisine has a remarkable variety of petit fours, both sweet and savory, that are the result of creativity and a sense of art. 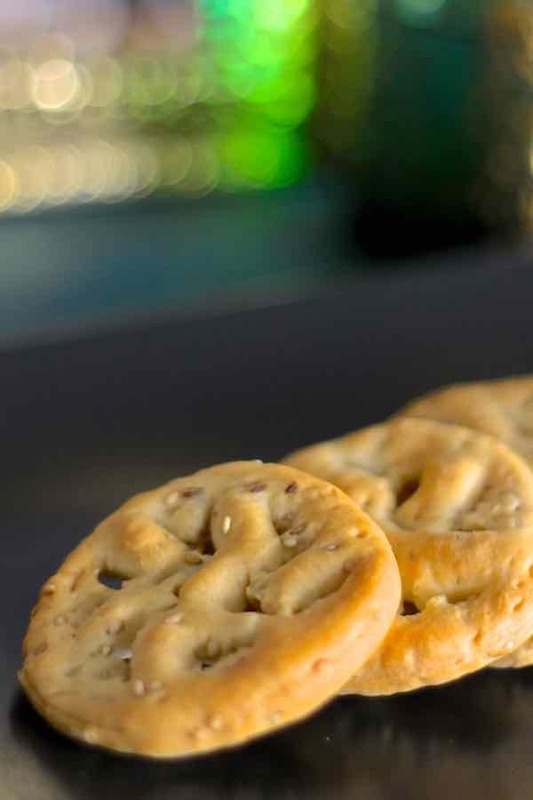 For these savory crackers, you can of course use decorative rollers but they would not look like the galettes salées (savory crackers) of our childhood. After cutting each cracker with a cookie cutter or a serrated wheel, you have to pinch the dough and pierce through it at the same time using your thumb and index finger. For some galettes, I had fun using the famous clip I mentioned in my cornes de gazelle recipe: the mangach. I must admit that the serrated sides, which were rather pretty, did not resemble the traditional shape and decoration of our ancestors. So, “you clamp with the thumb and index, and you pierce the dough”! May I suggest you practice with play dough first? This is what I usually do before making a recipe that requires certain skills or for example when I want to innovate a new braiding technique for challah. These savory crackers are real little jewels, handmade and require some training, I must admit! In Judeo-Arabic, we called them rghaif, which means “galettes” in Arabic. In traditional Moroccan cuisine (not Judeo-Moroccan), rghaif are actually another recipe. After asking our Moroccan expert Bouchra for advice, she told me that the ingredients of the traditional Moroccan rghaif were exactly the same as those of my savory crackers, except for the anise and sesame seeds. The first part of the recipe is also the same and consists of a simple bread dough. However, the second part differs: Moroccan rghaif, which also need to be laminated but without a pasta roller, are cooked in the pan with a lot of fat while my savory crackers are laminated with the help of a pasta roller, then are baked in the oven. 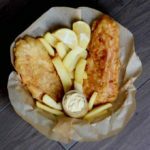 Some of us live far from our native country and love remembering about our childhood through older and traditional recipes. We can all reminisce about our childhood, through flavors, smells, textures, or simply a preparation. For me, these savory crackers are the memory of great teamwork! There were always at least 5 of us to prepare them. It was almost a mini factory, filled with joy, good humor, and music! And we did not just make a small batch, believe me! One of us was kneading, the other one was laminating, another was making the feuilletage, and there was one who was doing the shaping, while all us pinched and poked holes before sending a dozen long baking sheets to the municipal oven where our galettes were cooked in a wood fire! Very ceremonial! Today, let me share with you a precious little corner of my memory! 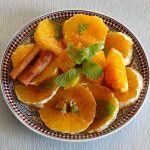 This recipe is validated by our Moroccan culinary expert Bouchra Lakouanane, author of Moroccan cuisine food blog Ma Fleur d’Oranger. 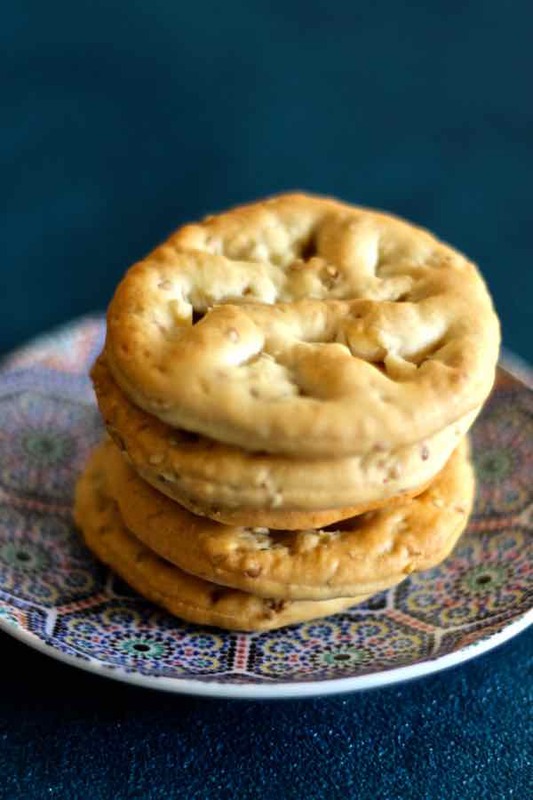 Galettes salées (savory crackers) are a Jewish recipe from Morocco. 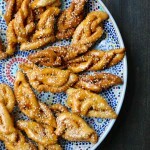 They are traditionally garnished with aniseed and sesame seeds. Mix the flour, sugar, sesame and aniseed, and yeast in the bowl of your stand mixer. Dig a well in the center and pour in the oil. Start the mixer at low speed by slowly incorporating the water until a smooth but firm dough is obtained. 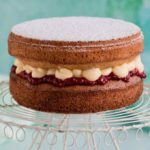 It is very important to incorporate the water very gradually because the quantity of water for this recipe varies according to the flour used. Once the dough is pulls away from the sides of the bowl, incorporate the salt and increase the speed of the mixer. Knead for 5 minutes. Cover the dough and let it rise in a warm place for about an hour. Punch the dough and knead it again in the stand mixer bowl for 2 minutes. Preheat a convection oven to 350 F.
Cut the dough into 28 pieces of equal weight (7 doughs will be used for each puff pastry). Stretch each dough piece using the pasta roller to a thickness of about 2 mm. Place each of the 7 laminated dough rectangles on top of each other to form a long thick strip. Cut 7 dough pieces from this strip and repeat the laminating operation, then place them on top of each other. Finally, cut 7 dough pieces again. Laminate each dough piece with the pasta roller, place on a working surface and cut round or square pieces with a cookie cutter or a serrated wheel. Immediately decorate the first galettes to prevent the dough from rising again. To decorate, pinch the dough several in a few places using the thumb and index finger and poke at the same time. Use the other hand's index finger to push through the dough and pinch it more easily. Bake until lightly browned, about 15 minutes per baking sheet. Repeat the laminating process until all the 28 dough pieces are used. 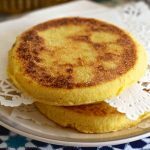 So glad to have stumbled by – it’s been a couple of decades since I had a “galettes salées” and this recipe takes me back to my teen years in Abu Dhabi! These sounds wonderful!